(L to R): Board President Joe Bertrand, OFHS PTA V.P. Claudia Ferrini, PTA Council V.P. 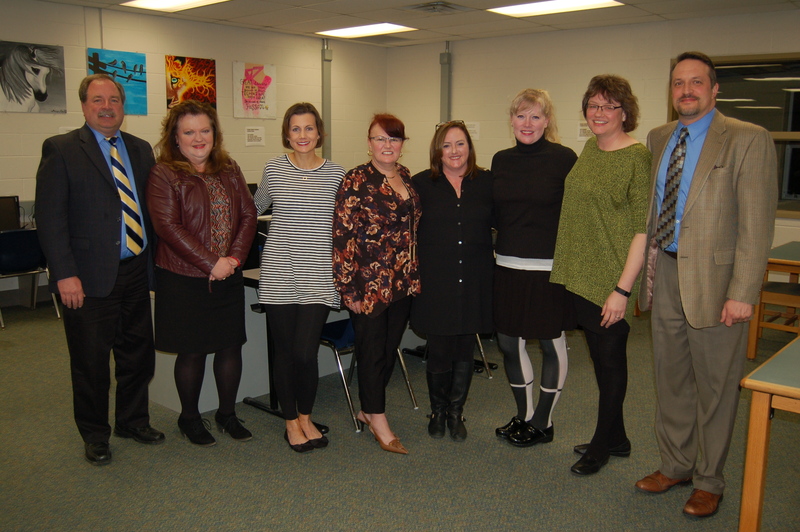 Julianne Allen, OFMS PTA President Tricia Vidovich, PTA Council President Kelly Walker, OFIS PTA President Kerry Kramer, OFHS PTA President Sandra Graham and OFCS Superintendent Dr. Jim Lloyd celebrate National PTA School of Excellence awards at Feb. 23rd Board of Education meeting. During February’s monthly board meeting, the Olmsted Falls Board of Education proudly and formally recognized the Olmsted Falls PTA Council and the district’s local PTA units for earning the prestigious National PTA School of Excellence award. Only 173 schools and their PTA units were recognized nationwide – and four of those units are right here in Olmsted Falls! Falls-Lenox/ECC, Olmsted Falls Intermediate School, Olmsted Falls Middle School and Olmsted Falls High School have all been recognized as National PTA Schools of Excellence. The School of Excellence designation is the highest honor awarded by National PTA and recognizes schools for their strong and effective family school partnerships. Board of Education President Mr. Joe Bertrand and OFCS Superintendent Dr. Jim Lloyd helped acknowledge the ongoing hard work and dedication of our local PTAs that earned them this national recognition. The commitment and energy of the PTA units across the Olmsted Falls School District bring great added value to Bulldog students and families, and make our local PTA an exemplary organization for other across the nation! Congratulations again PTA! (L to R): Board President Mr. Joe Bertrand, OFHS Assistant Principal Mr. Patrick Griffis, Scholastic Gold Key winner Kayla Mandak, Scholastic Silver Key winner Lauren Gumeny, and OFCS Superintendent Dr. Jim Lloyd during February Board meeting honors. 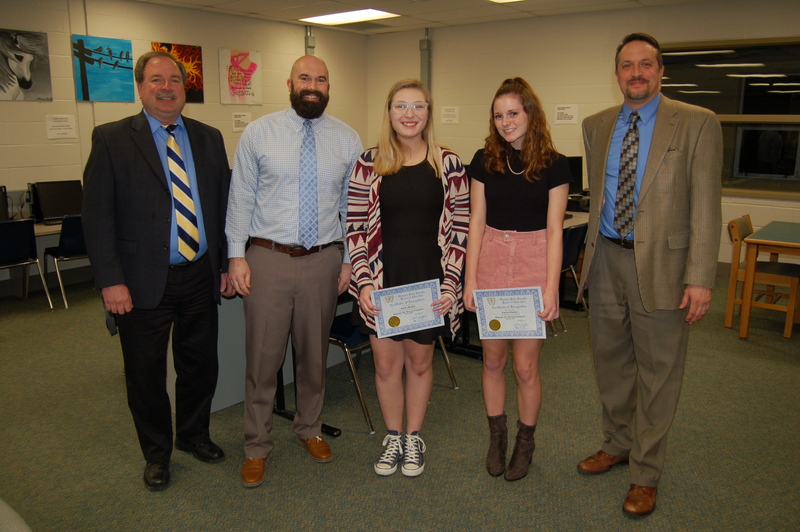 At the February meeting, the Board of Education also honored several OFHS students for their recent artistic accomplishments in the annual Scholastic Art & Writing Competition. Students recognized included Gold Key winner Kayla Mandak, Silver Key winner Lauren Gumeny; and Honorable Mention award winners Dylan Briggs, Kailie Gelatka, Cody Kelley, Evan Martin and Disha Rathod. All of these students had their award-winning works displayed in a featured exhibit at the Cleveland Institute of Art’s Reinberger Galleries this past January. To view the works of all of these outstanding artists in an online gallery, please click HERE. Congratulations again to all of these talented Bulldogs! The OFHS Jazz Band and Golden Expressions will perform at the Olmsted Falls Music Association’s annual Ballroom Blitz event TONIGHT – FRIDAY, FEB. 24TH. It begins at 7 p.m. in the OFHS “Café Ballroom.” Tickets are $10 for adults and $7, students and seniors 65 and above. Enjoy great music, dancing, finger foods, appetizers, desserts, raffles, door prizes and more! OFHS ENTREPRENEURSHIP STUDENTS HOST CLASSIC FAMILY MOVIE NIGHT @ OFHS THIS SATURDAY NIGHT – DOORS OPEN AT 6:30 P.M.
A group of students in Mrs. Cleary’s entrepreneurship class at OFHS has planned this Saturday’s Family Movie Night as part of their coursework for this new class – and it promises to be fun for the whole family! Don’t miss this fun evening of family entertainment as the OFHS auditorium is transformed into a classic movie theater – complete with movie-style concession stand selling popcorn, candy and pop for guests. The movie is The Incredibles. Doors open at 6:30 p.m. with the movie showing from 7:30-9:30 p.m. in the OFHS auditorium. Admission prices: $4 for 1 person, with an adult accompanying anyone younger than grade 6; $8, family of 2; $11, family of 3; $14, family of 4; $17, family of 5 and $3 for each additional person after that. Proceeds will benefit Post Prom. To download the event flyer, please click HERE. OFIS Principal Mr. Don Svec and Technology teacher Mrs. Kim Krock pose proudly with members of the SWAT team following an impressive presentation at the February Board of Education meeting. 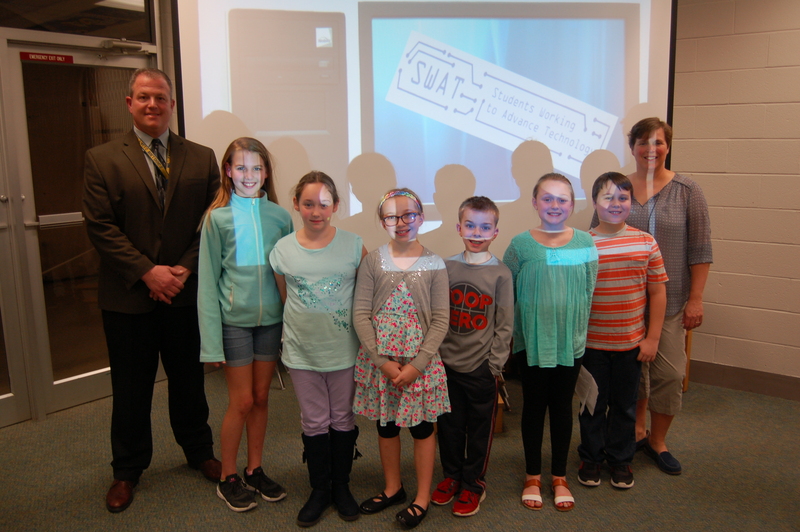 Students from Olmsted Falls Intermediate School were on hand at this month’s Board of Education meeting, along with technology teacher Mrs. Kim Krock and Technology Integration Specialist Mrs. Dawn Carlin, to share their knowledge and experience as members of the OFIS SWAT club. SWAT stands for Students Working to Advance Technology and there was no doubt in the room that this impressive group of young techies are doing just that! The group made an impressive presentation that includes video clips they’d made as members of the SWAT team, as well as a hands-on demonstration. To view photos of SWAT’s presentation at the Board of Education meeting, please click HERE. Thanks again to this awesome group of students and the amazing adults who inspire their learning each day! 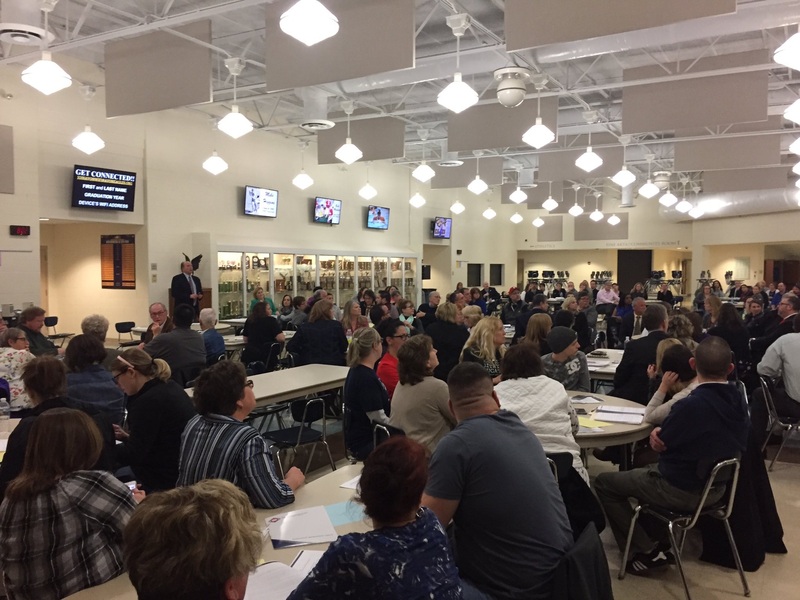 Approximately 150 parents, community leaders and local educators packed Avon High School this past Tuesday, February 22nd for a grass-roots community forum to discuss the State’s latest ESSA (Every Student Succeeds Act) proposal. OFCS Superintendent Dr. Jim Lloyd, along with superintendents from Amherst, Avon, Clearview, Columbia Station, Elyria, Keystone, North Olmsted, Oberlin, Olmsted Falls, Berea and Wellington school districts, led these local efforts. The event was also covered by media outlets who have been following closely these local efforts to provide citizens an opportunity to help shape critical local response to the a new federal law, called the Every Student Succeeds Act, which gives states more flexibility in creating educational standards for our public schools. 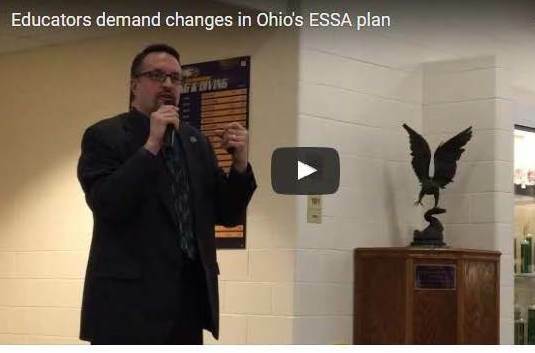 One of the items discussed was a recommendation from area school superintendents and curriculum directors to make changes in Ohio’s plan for high stakes student testing. Thank you to all of these local superintendents for their leadership and for helping give a voice to our local communities! 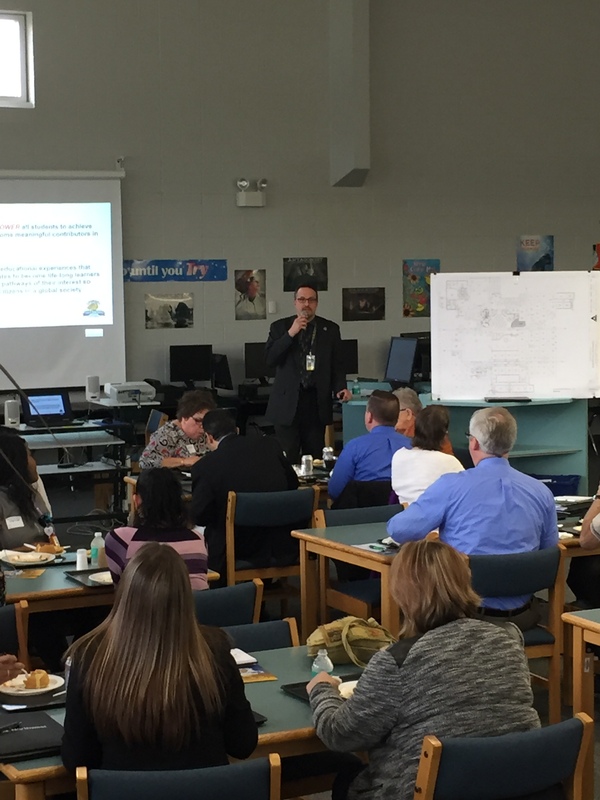 Olmsted Falls City Schools was pleased to host this month’s regular meeting of the Olmsted Chamber of Commerce in the Olmsted Falls Middle School Media Center. 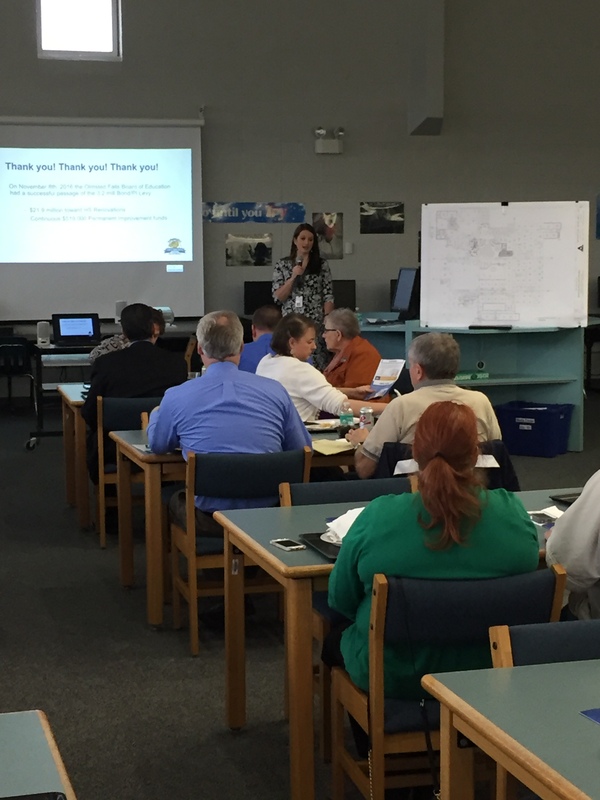 OFCS Superintendent Dr. Jim Lloyd and OFCS Treasurer Ms. Emily Dales had the opportunity to update the group on latest district news – including academic, facilities and financial updates. Additionally, teachers and students from Olmsted Falls Middle School made a special presentation highlighting Project Lead the Way (PLTW) courses offered in-house at OFMS through a fantastic partnership with Polaris Career Center. Project Lead the Way (PLTW) teachers Mrs. Wisniewski and Mr. Tarnowski were joined by two PLTW students from Olmsted Falls Middle School. 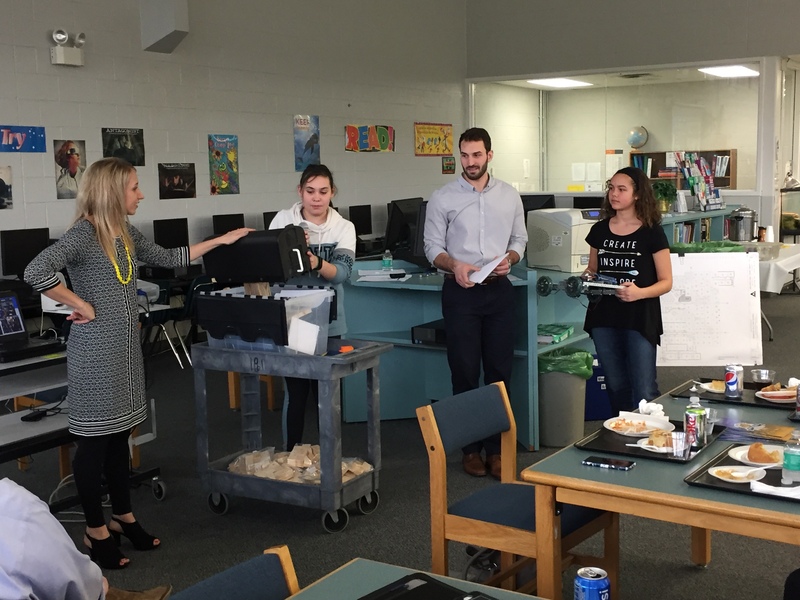 Project Lead the Way (PLTW) teachers Mrs. Wisniewski and Mr. Tarnowski were joined by two OFMS students – all of whom were both engaging and inspiring as they provided an overview of PLTW courses currently offers at OFMS including: Design & Modeling; Medical Detective and Robotics. 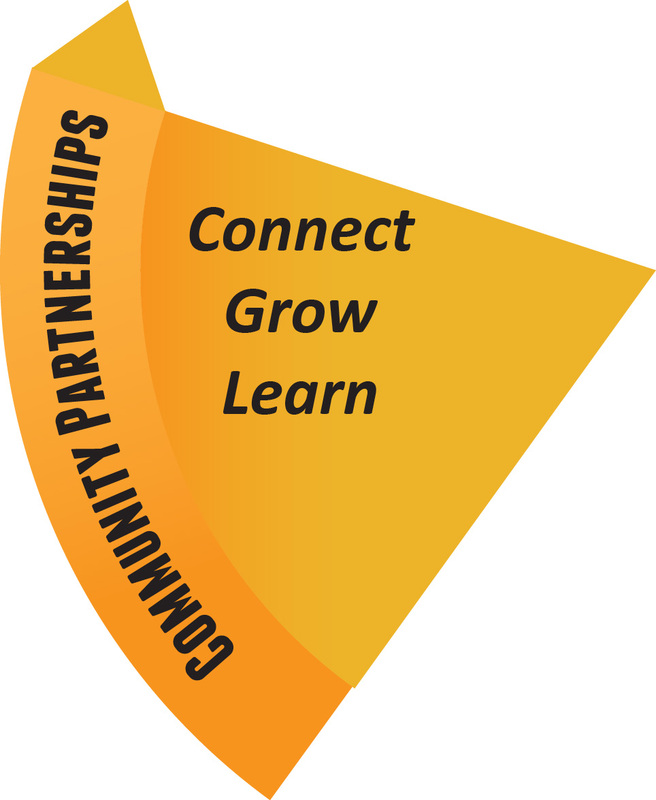 Thank you to the Olmsted Chamber of Commerce for its ongoing partnership and support of Olmsted Falls City Schools. The opportunity to host this month’s lunch meeting and share the latest developments in our “Triple A” district was much appreciated. Thank you also to the OFCS Food Services Department for the delicious lunch! OFIS Language Art Teachers Mrs. Connelly and Mrs. Pilko hosted a Bookworm Bash after school February 16th. About 90 students stayed to READ! While reading, they enjoyed many delicious treats and tracked how many pages everyone read. Then they ate pizza and ended the night with some wonderful mystery readers. What a great way to spend a few extra hours after school! To see a photo gallery of the children reading and special readers, click HERE. 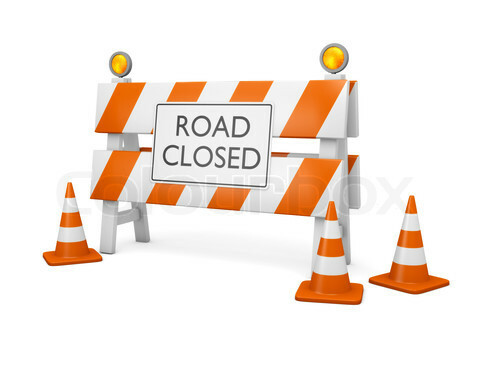 On Friday, February 24th at 5:00PM the planned detour on Bagley Road between Stearns Road and Bronson Road will change from an eastbound only directional pattern to a westbound only directional pattern. This change is likely to stay in effect through the remainder of the school year, so there have been some necessary updates made to AM and PM school bus routes to accommodate the westbound traffic pattern. On Thursday, February 23rd notices were given to all students on the school bus routes that are directly effected by the change. 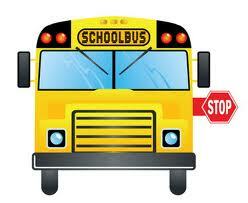 This includes Elementary Bus #88, Middle School Bus #87, and High School Bus #91. If your student rides one of these bus routes and you have any questions at all, please call the Transportation Department at 440-427-6350. The Falls-Lenox Book Fair will begin this Monday, February 27th and continue through Friday, March 3rd in the school’s Media Center. 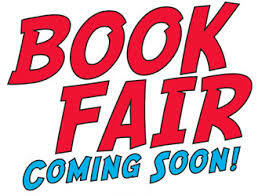 Families are invited from 4-7 p.m. Wednesday, March 1st to shop during the book fair. 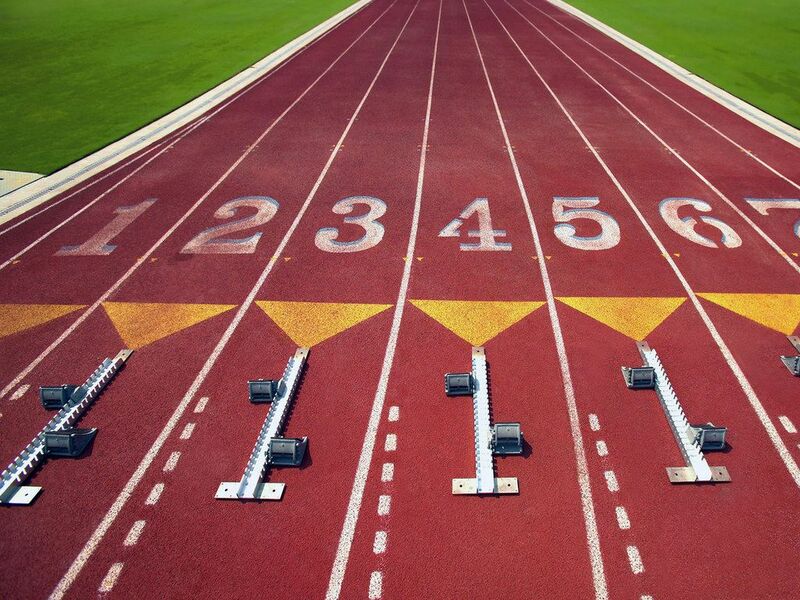 The OFHS track and field meeting is scheduled for 7 p.m. Tuesday, February 28th, in the OFHS Media Center. Parents of high school athletes who plan to participate in track and field this spring should attend this important meeting. Contact Coach Novotny at jnovotny@ofcs.net for more details. The Olmsted Falls Forensics Team is seeking adult volunteers – parents and teachers – to help with concession sales and general tournament set-up and operations when Olmsted Falls hosts the 2017 Ohio High School Speech League State Tournament on March 3 & 4. The flu vaccine is still available across Ohio as flu-like illness continues to increase and the number of hospitalizations remain high. 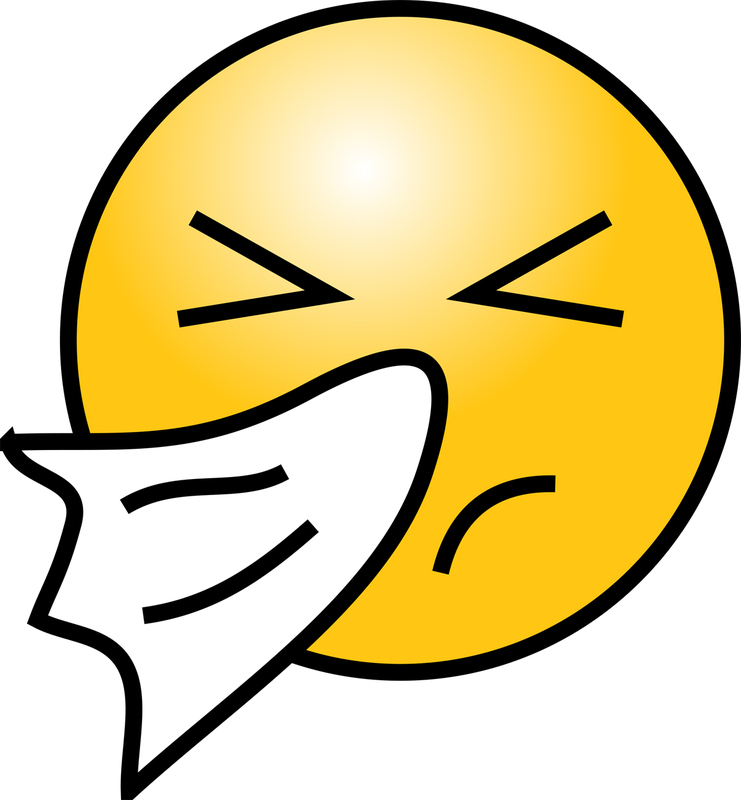 Signs of the flu can include fever, cough, sore throat, body aches, headache, chills and being tires. It is not too late to receive a flu vaccine. Please continue to be Healthy Heroes!!! For more information on the flu, please contact the Ohio Department of Health at www.flu.ohio.gov. 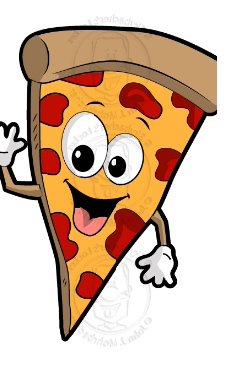 Hurry to reserve your spot for the All Pro Dad Pizza Party March 8th at Falls-Lenox. Bring your children during the 6-7 p.m. event that has a 5:45-6 p.m. check-in time. There will be plenty of pizza and fun during the one-hour party. Reserve your spot – and your child’s – by March 3 by returning the form found HERE or email olmstedallprodad@gmail.com with your name and the number of children attending with you. An informational night is set at 7 p.m. March 6th for the Olmsted Falls High School Drill Team. It is in the OFHS Room W-3. The Ohio High School Speech League State Tournament will be held March 3rd and 4th locally – at OFHS, OFMS and OFIS. The Olmsted Falls School District is hosting the tournament this year. Mark your calendars for the remaining meetings leading up to Post Prom on May 21. They will all take place at 7 p.m. in the OFHS Media Center: March 15; April 12 & 26; May 3, 10, & 17. 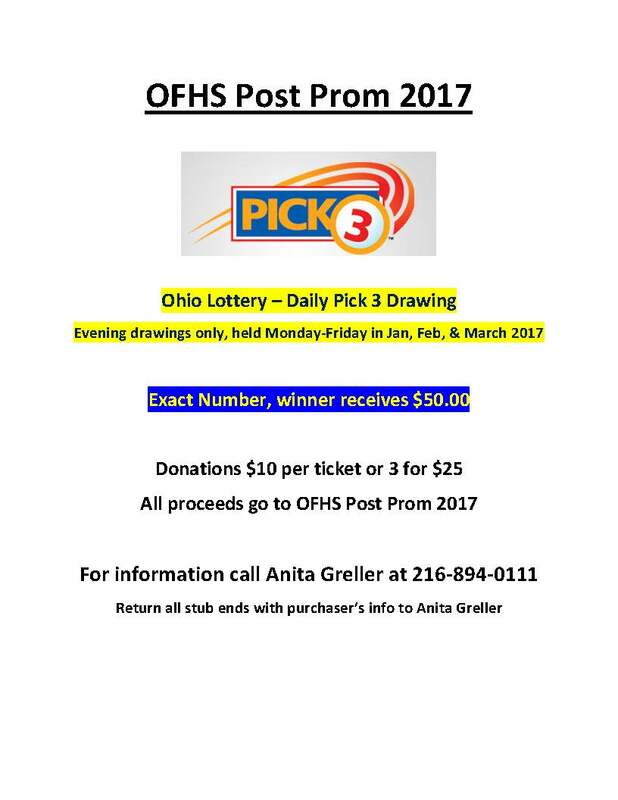 Parents of Olmsted Falls Intermediate School students can help in a fundraiser that runs until April. They are encouraged to cut out and send in box tops. 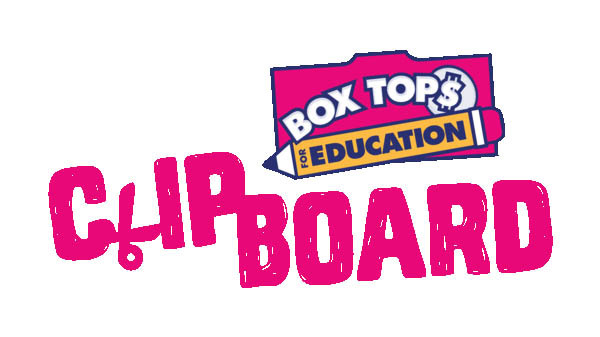 The PTA earns 10 cents for each box top, which will help pay for field trips, end-of-the-year events and other activities at the school. 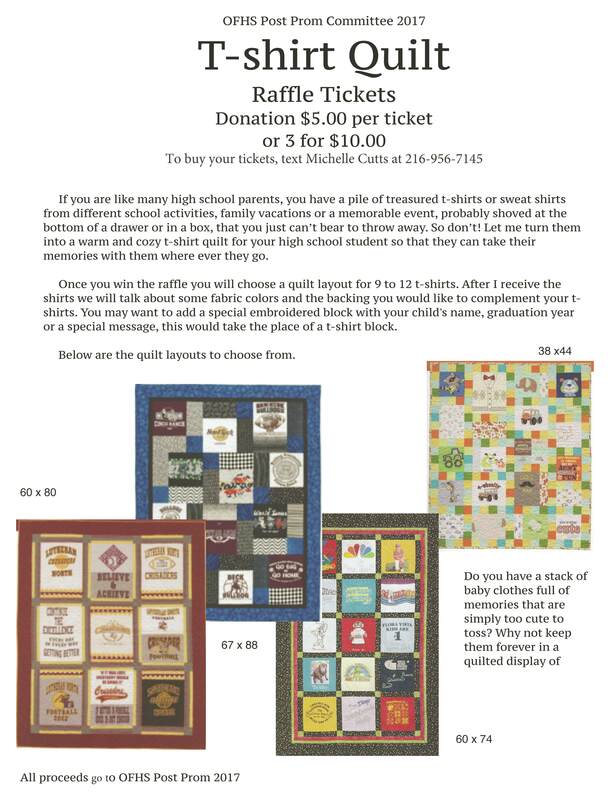 To view a flier explaining the fundraiser, click HERE. 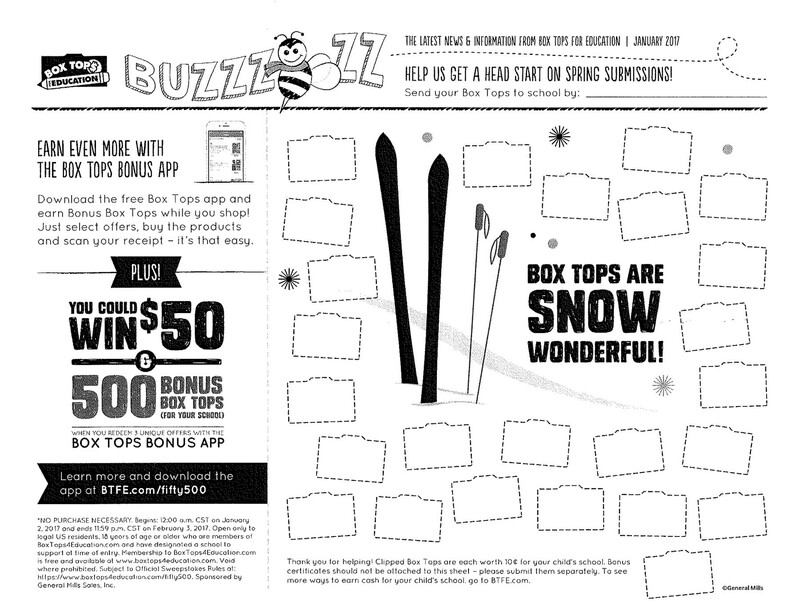 For more details, go to boxtops4education.com. Please be sure to note there will be NO SCHOOL FOR STUDENTS TOMORROW, FRIDAY, FEBRUARY 17TH due to a District Professional Development Day for staff. 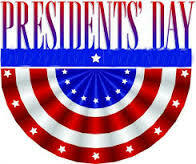 The District will also be CLOSED ON MONDAY, FEBRUARY 20TH in honor of Presidents’ Day. All school buildings will be back in session on Tuesday, February 21st. Enjoy the long holiday weekend! OFHS HOCKEY TEAM SCORES 1ST BARON CUP II CHAMPIONSHIP!!! The Bulldog hockey team skated to a big win over Avon High School Sunday afternoon in the 6-1 contest. The team won the Baron Cup II, the first time in school history. A special thanks to the community who showed up in great numbers and cheered the players to victory. That support really helped! To view an article of the victory, click HERE. Congratulations to National Merit Finalist Eli Tomasch, OFHS senior. Congratulations to Eli Tomasch, who was announced as a finalist in the National Merit Scholarship Program earlier this week. Eli met all the requirements as a Semifinalist to advance to Finalist standing. All finalists will be considered for National Merit Scholarships this year. The selection of some 7,500 Merit Scholarship winners from the group of more than 15,000 Finalists is now in progress and notification of offers will be made to those selected next month. 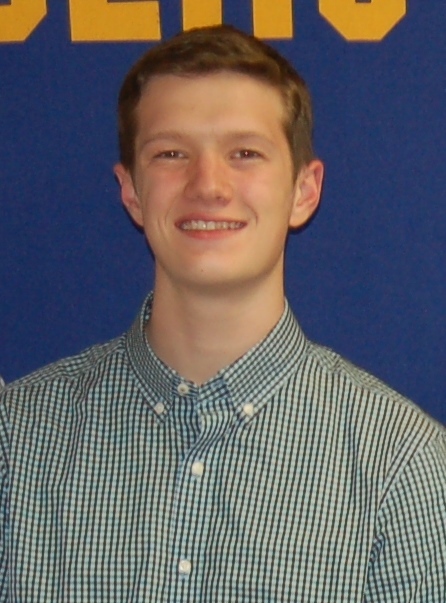 Eli took the 2015 Preliminary SAT/National Merit Scholarship Qualifying Test last year and performed well to be named a Semifinalist. More than 1.6 million students took the test and entered the program. It then identified the 50,000 highest scorers, of which 16,000 of those high performers became Semifinalists and continued on by meeting several additional requirements. Please join us in congratulating Eli, and wishing him well as he continues through this third and final level of the National Merit Scholarship Program! Standard & Poor’s (S&P) Rating Service has upgraded Olmsted Falls City Schools’ long term credit rating into the AA level! 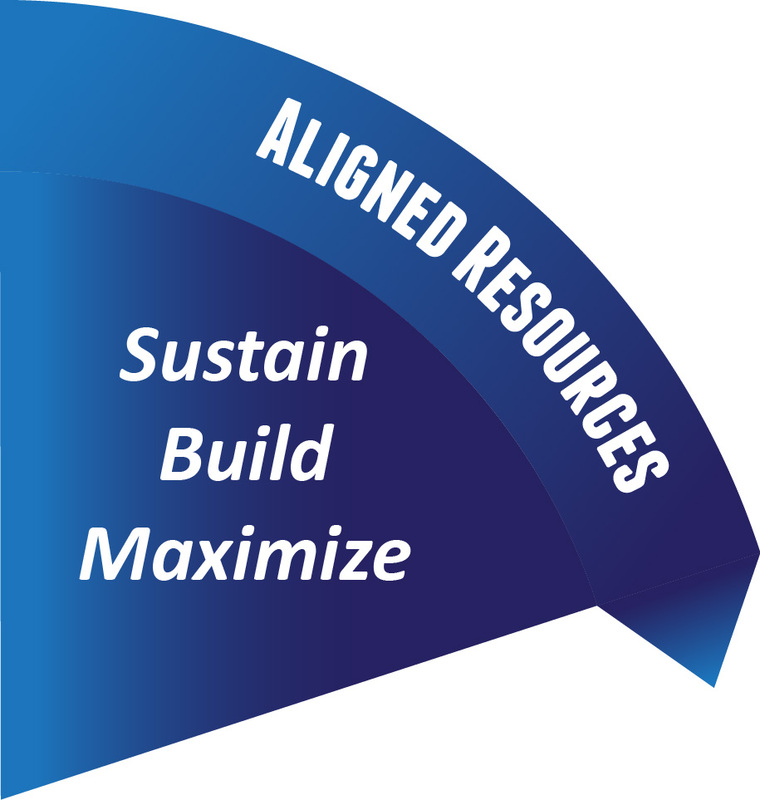 This upgrade from “A+” to “AA-” is due in part to the passage of the district’s zero additional taxes bond issue on the November 2016 ballot, and will create savings for taxpayers. 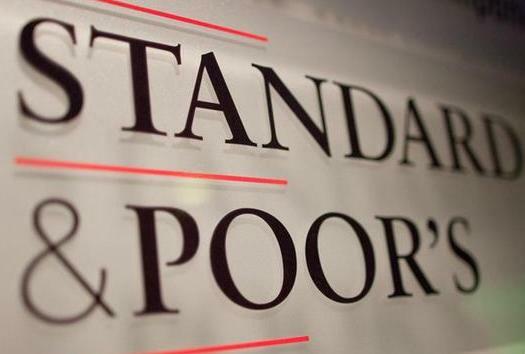 To read to full press release and access the Standard & Poor’s report, please click HERE. If only Mom joined this year, it’s not too late. Dad can save time at the door by signing up now. Just download and complete the form (available below) and submit your dues prior to arrival. Can’t remember if you already signed up? E-mail Membership at lindsay0718@yahoo.com to find out. If Dad is already a PTA member, just RSVP and show up! Click HERE to download the event flyer with RSVP form. The event is from 7:30-8:30 a.m., Friday, February 24th, in the OFMS Cafetorium. Hope to see you there! Cleveland.com reported on the upcoming Community Forum earlier this week. On February 22, a Community Forum will be hosted at Avon High School to provide citizens in northeast Ohio with an opportunity to help shape the local response to a new federal law, called the Every Student Succeeds Act, which gives states more flexibility in creating educational standards for our public schools. One of the items to be discussed will be a recommendation from area school superintendents and curriculum directors to make changes in Ohio’s plan for high stakes student testing. OFCS Superintendent Dr. Jim Lloyd, along with superintendents from Amherst, Avon, Clearview, Columbia Station, Elyria, Keystone, North Olmsted, Oberlin, Olmsted Falls, Berea and Wellington school districts, are part of these local efforts. All parents and community members are invited and encouraged to attend. To read a recent article by Plain Dealer education reporter Patrick O’Donnell about the forum and local efforts, please click HERE. 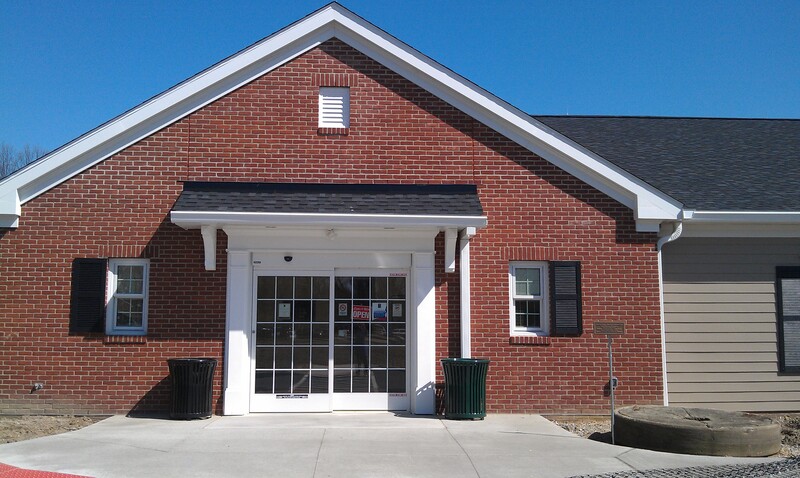 The February 22nd Community Forum will be held at 7:00 p.m. at Avon High School located at 37545 Detroit Road in Avon. For additional information on the forum, click HERE. To read the latest news release issued by the Ohio Department of Health on Feb. 10th regarding the current status of the flu virus in Ohio, please click HERE. Anyone submitting stories or pictures to the March Musical Notes newsletter should do so by TOMORROW – February 17th – or now – due to the DisneyWorld band trip. SAVE THE DATE! 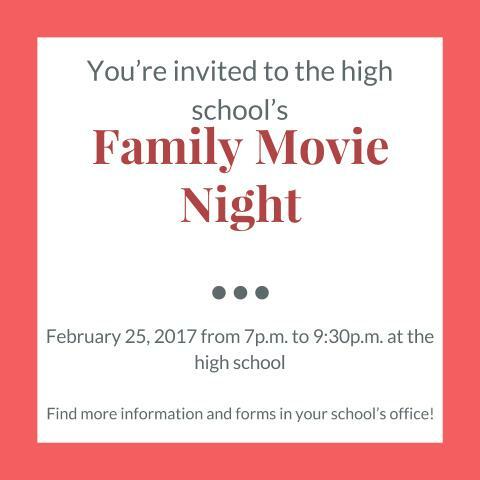 FEB 25TH FAMILY MOVIE NIGHT @ OFHS 7-9:30 P.M.
A group of students in Mrs. Cleary’s entrepreneurship class at OFHS is planning the February 25th Family Movie Night event. Proceeds will benefit Post Prom. The event promises to be fun for the whole family and will include a movie-style concession stand selling popcorn, candy and pop for the guests. More information to come! In the meantime, mark your calendars for Family Movie Night fun on February 25th! Hope to see you there! An informational night is set at 7 p.m. March 6th for the Olmsted Falls High School Drill Team. It is in the OFHS Room W-e.
Get ready for the ride of your live at the April 8th Olmsted Falls Athletic Boosters Night at the Races. It will be at St. Demetrios Center in Rocky River. Tickets are $35 a person or $280 for a table of 8. Learn how to create your own digital animation from SCRATCH! Students in 5th-8th grade are invited to join us as we explore, create, and share our own stories, games, music and art! Imagine! Program! And Share! To register, click HERE. Note: If you do not currently have a Scratch account, please bring a valid email address. Standard & Poor’s (S&P) Rating Services has upgraded Olmsted Falls City Schools’ long-term credit rating from an “A+” to “AA-.” This upgrade is due in part to the passage of the district’s zero additional taxes bond issue on the November 2016 ballot. S&P provides credit ratings for school districts as a reflection of the district’s financial history, current financial situation and the district’s ability to pay its debts in the future. There are nine different categories of ratings with AA being the second highest possible category. This indicates that the district’s ability to meet its financial obligations is very strong. To read the full report from S&P regarding the district’s enhanced long-term credit rating, please click HERE now or visit the OFCS Treasurer’s web page anytime at www.ofcs.net/treasurer. OFHS HOCKEY TEAM SKATES INTO BARON CUP II SEMIFINALS TONIGHT! 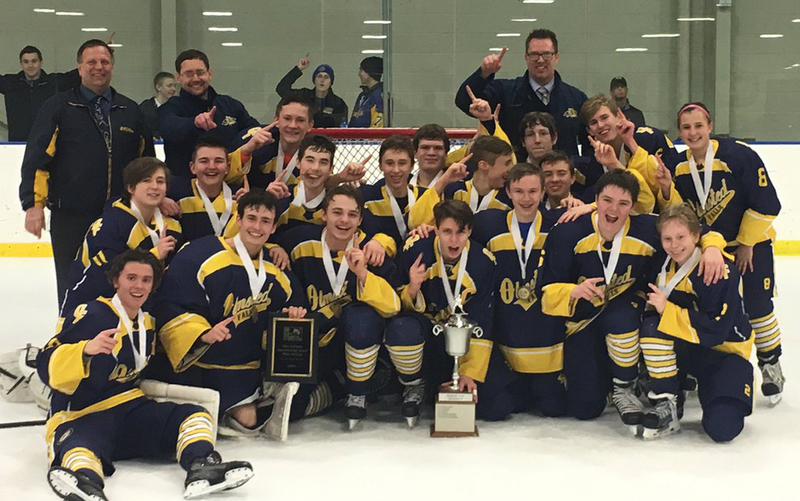 The Olmsted Falls High School hockey team won its first game this week in the Baron Cup II competition. It plays Chagrin Falls in the semifinals at 7:30 p.m. TONIGHT, FRIDAY, FEBRUARY 10th at Brooklyn Ice Rink. With a possible victory Friday night, the team would play in the Championship this Sunday. Congratulations to the team! 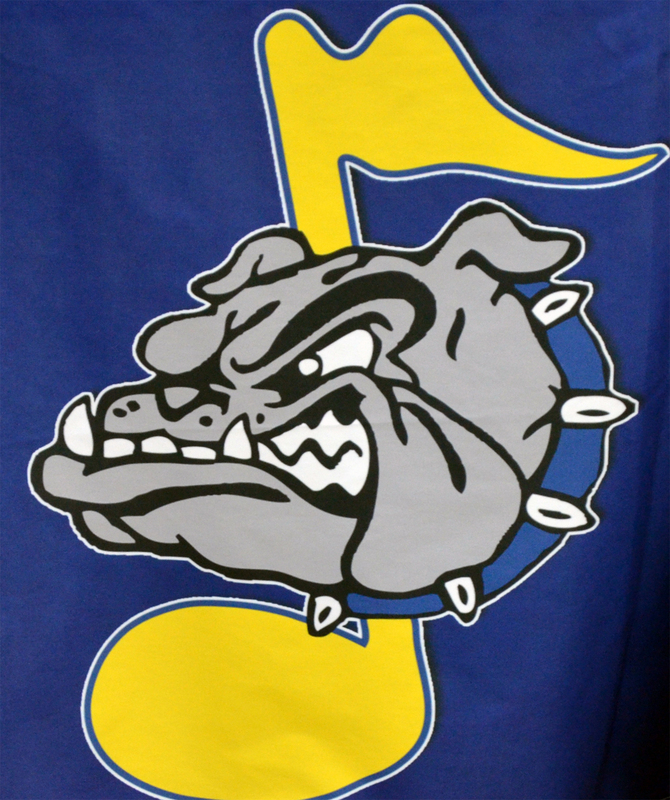 Let’s get behind the battling Bulldogs as they continue in the tournament Friday and, hopefully, Sunday. Keep it going Bulldogs! OFCS Kindergarten enrollment for 2017-2018 is now officially open. Welcome to the 130+ who have already completed the online registration step! Everyone at the Early Childhood Center looks forwards to meeting you! It’s a sure bet you’ll have a great time this Saturday at Olmsted Falls Alumni Association’s Las Vegas Night. 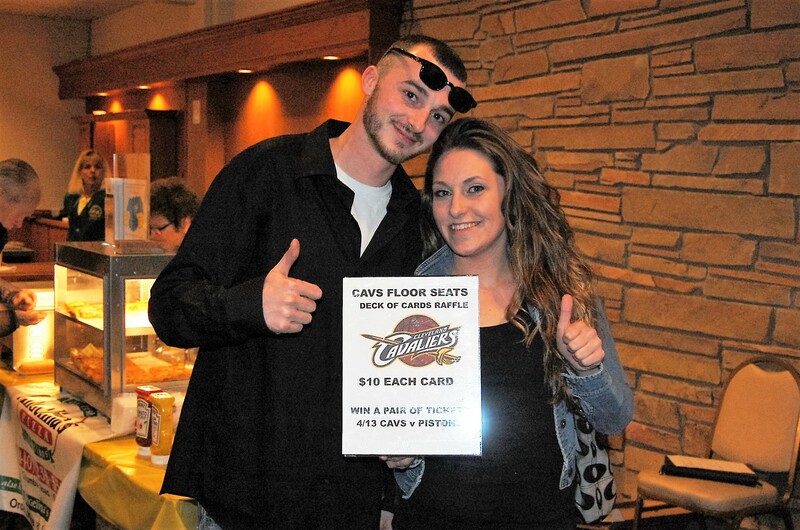 Two sets of Cavs floor seats will be raffled during the event. It’s easy to win – just purchase a playing card for $10. You have a one in 52 chance of winning a pair of floor seats to the April 12th Cavs vs Raptors game. Indians tickets also are part of a giveaway. Who will be the lucky winners of these special prizes? Test your luck from 7-11:30 p.m. THIS SATURDAY, FEBRUARY 11TH at the West Side Irish-American Club on Jennings Road in Olmsted Township. The night includes a big wheel, dice, black Jack, let it ride, poker, Texas hold ‘em and others as well as 50/50 raffle, side boards and others. There is a cash bar and refreshments that Angelina’s Pizza will provide. 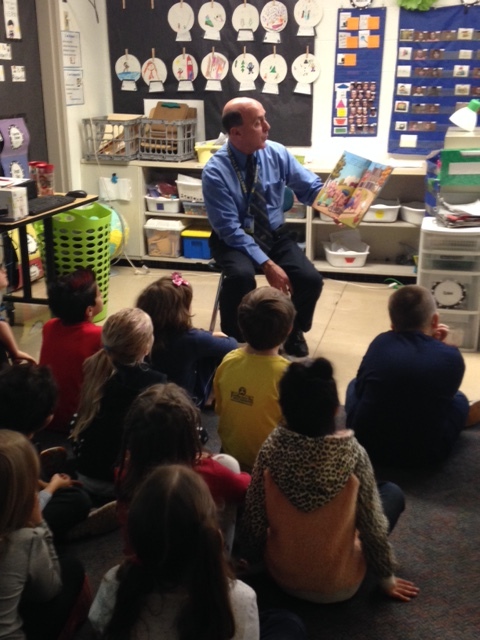 FALLS-LENOX RIGHT-TO-READ WEEK FEATURED MANY SPECIAL GUESTS & ACTIVITIES! It has been a very busy week at Falls-Lenox as the school celebrated Right to Read Week with many special visitors and activities! 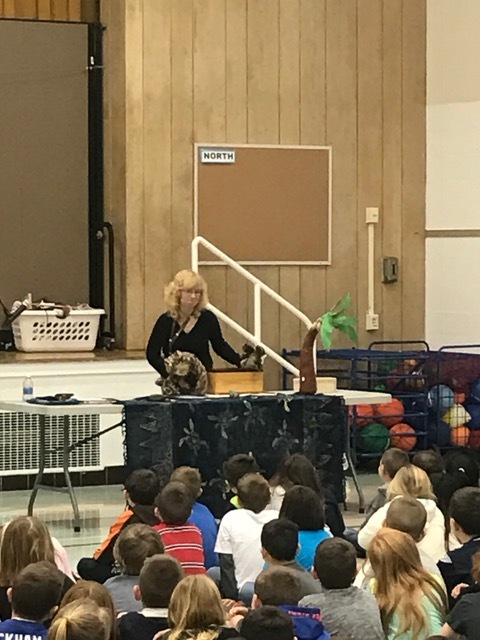 On Monday Sue Grame, Children’s Librarian from the Olmsted Falls branch of the Cuyahoga County Library came to read to all students! 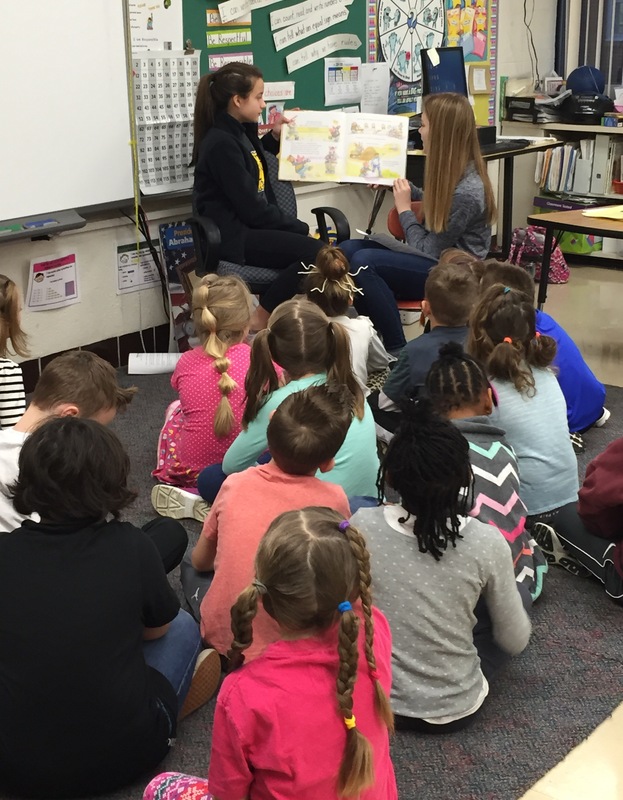 On Tuesday, they had students from the Middle School come to read to their classes (see next blog items for details and photos)! Throughout the week, more than 80 volunteers from throughout the district and community served at special mystery readers in classrooms. 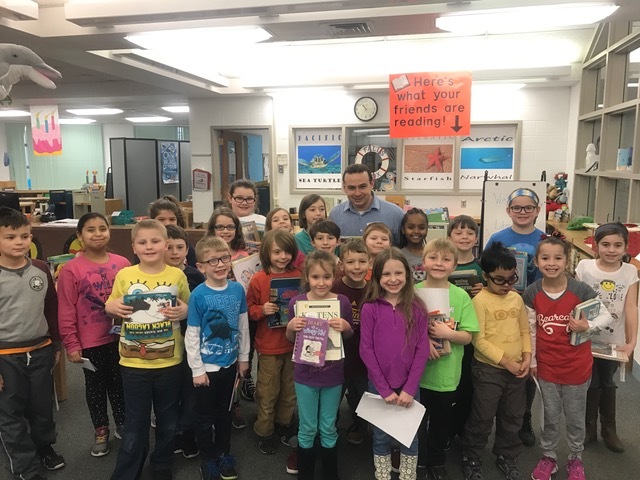 Board members, administrators, local elected officials, safety forces and business owners were among the many special guests – each bringing in their favorite children’s book or choosing one from the Falls-Lenox library. On Wednesday, children’s picture book author Michael Samulak, who has two published books: A is for Africa (Trafford 2008) and A Wonderful Day! (Tate 2015), spoke with students. Mr. Samulak also stayed to sign any books that were brought in. Thank you to PTA for organizing and funding this visit! 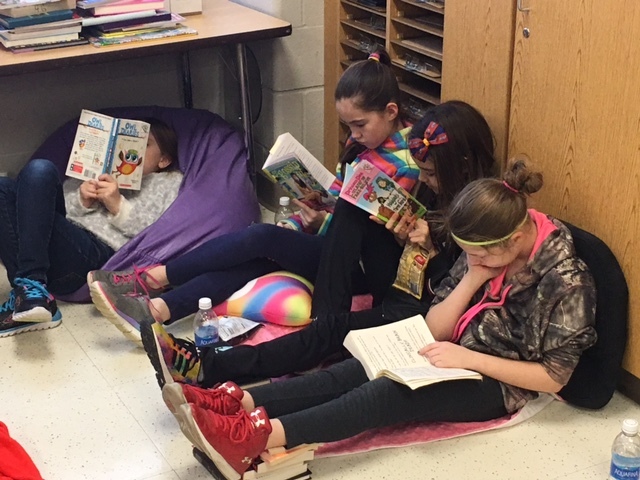 Students earned free time on Friday by reading over 55,000 minutes! Miss Longville and Mrs. Carey even made special appearances throughout the day dressed as a Narwhal and a Sea Turtle! This year each child at Falls Lenox received two books, courtesy of FL/ECC PTA during the week. Thank you to our PTA volunteers at Falls Lenox: Rachel O’Malley, Janelle Prada, Beth Prather, Michelle Smith and Angie Stokes for labeling books, delivering books to classrooms and planning the author visit. And thank you to all of our volunteer mystery readers! To view a photo gallery for Falls-Lenox Right To Read 2017, please click HERE. 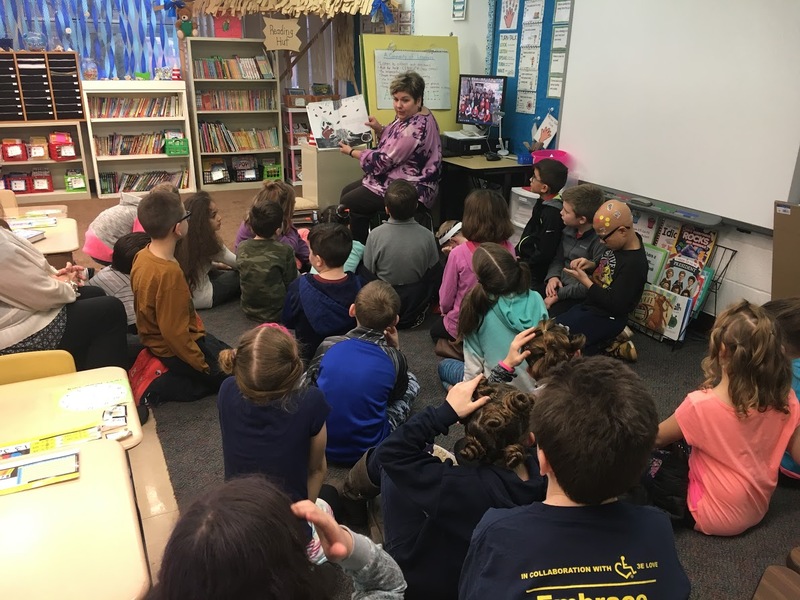 On Tuesday, February 7th, members of the LEAD organizations from the Middle School traveled to Falls-Lenox during Right to Read week and shared their love of reading. 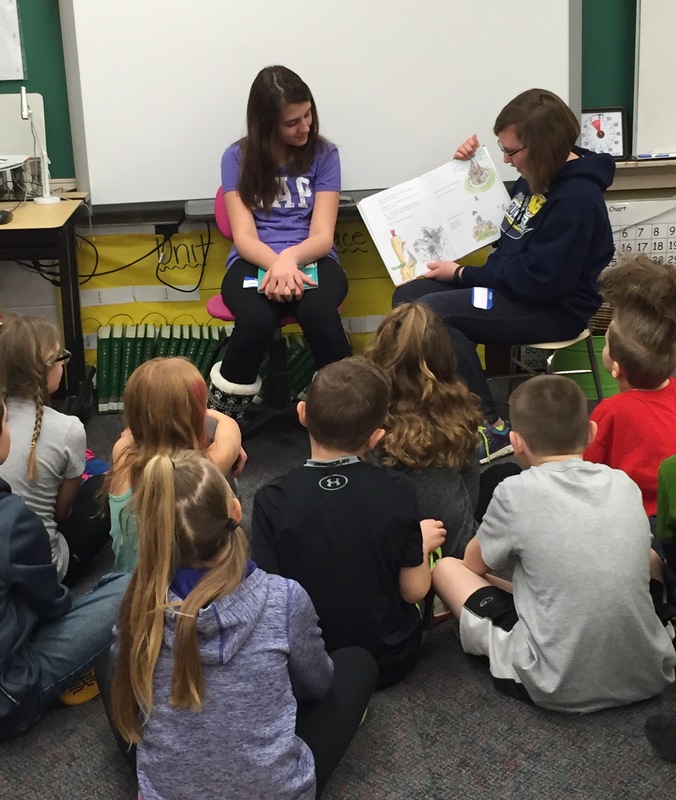 Middle School students read a picture book to a 1st, 2nd, or 3rd grade class. This was a great experience for all students involved! 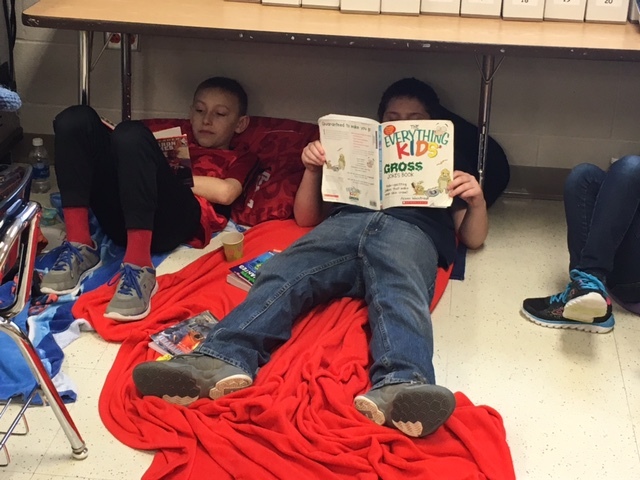 To view a photo gallery featuring photos from this OFMS LEAD visit to Falls-Lenox for Right To Read Week, please click HERE. 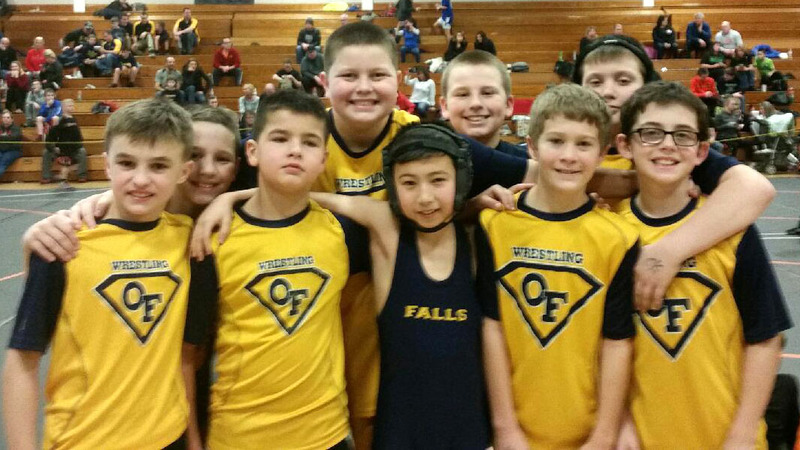 The Olmsted Falls youth wrestling team qualified 10 wrestlers to the upcoming district tournament at Kenston High School. The following wrestlers earned a chance to qualify for the state tournament by placing in the top four of their weight class at sectionals: Logan Gomez, Brendan Hearns, Andrew Connelly, Eddie Manning, Cort Zahorchak, Joey Salamone, Derek Neckar, Patrick O’Brien, Tyler Sherlock and Ian Heckerman. Congratulations and good luck at districts! 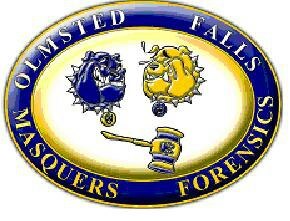 The next meeting of the Olmsted Falls High School Forensics/Masquers is at 7 p.m. this Monday, February 13th. 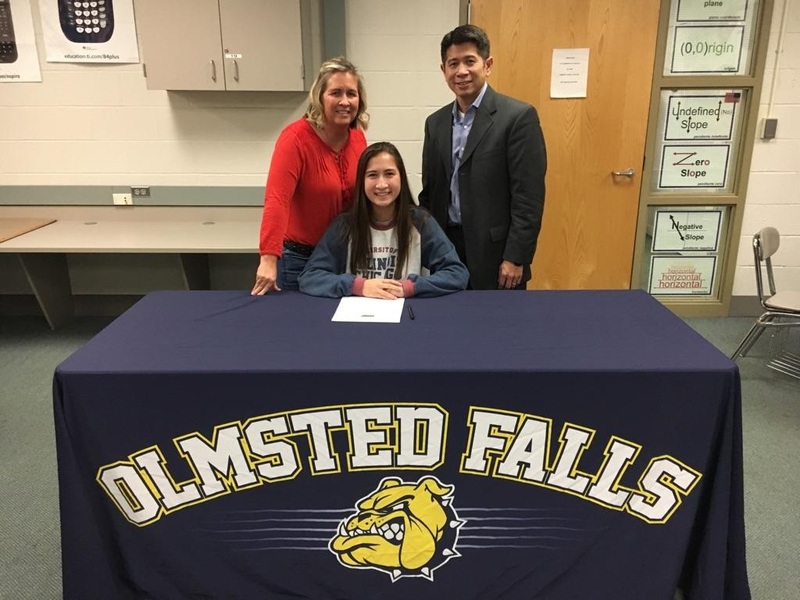 The agenda includes the upcoming state tournament that is being held at Olmsted Falls High, Middle and Intermediate schools and an update on the Spring musical. 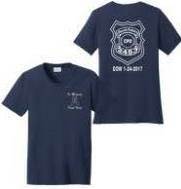 The Falls-Lenox staff dodgeball team will be wearing memorial shirts in honor of fallen Cleveland Police Officer David Fahey for this year’s dodgeball event. Students, parents and staff are invited to gear up in the memorial shirts as well. The deadline to order shirts in THIS MONDAY, February 13th. Please click HERE to download the official order form with additional information. Contact Mrs. Rivera at 440-427-6470 with questions. If Dad is already a PTA member, just RSVP and show up! Kindly RSVP by February 16th. Click HERE to download the event flyer with RSVP form. Please join us at our next regularly scheduled meeting next Wednesday, February 15th at 7 p.m. in the OFHS Media Center! Mark your calendars for the remaining meetings leading up to Post Prom on May 21. They will all take place at 7PM in the OFHS Media Center: March 15; April 12 & 26; May 3, 10, & 17. Anyone submitting stories or pictures to the March Musical Notes newsletter should do so by February 17th – or now – due to the DisneyWorld band trip. 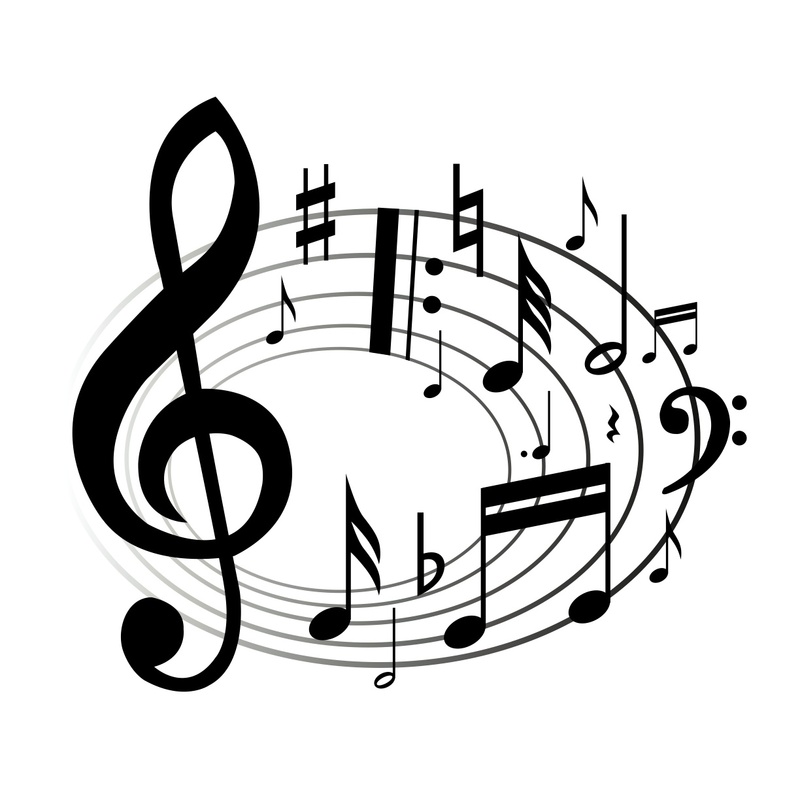 The latest Musical Notes newsletter is available by clicking HERE. It contains details of upcoming meetings, events, the Feb. 16-21 Disney trip, solo and ensemble contests, school winter concerts and hoagie sale pictures. Help the Olmsted Falls Intermediate School PTA raise money while promoting reading skills and education. OFIS PTA launched its local Read-a-Thon this past Monday holding various reading sessions to help raise funds. Supporters may donate money toward the program – and leave a word of encouragement – for students during this time. Please contact Brian Fritz for tickets at 216-337-4422 or B4421fritz@yahoo.com. To purchase a horse, please contact Terry Atkins at Terenceatkins22@gmail.com. 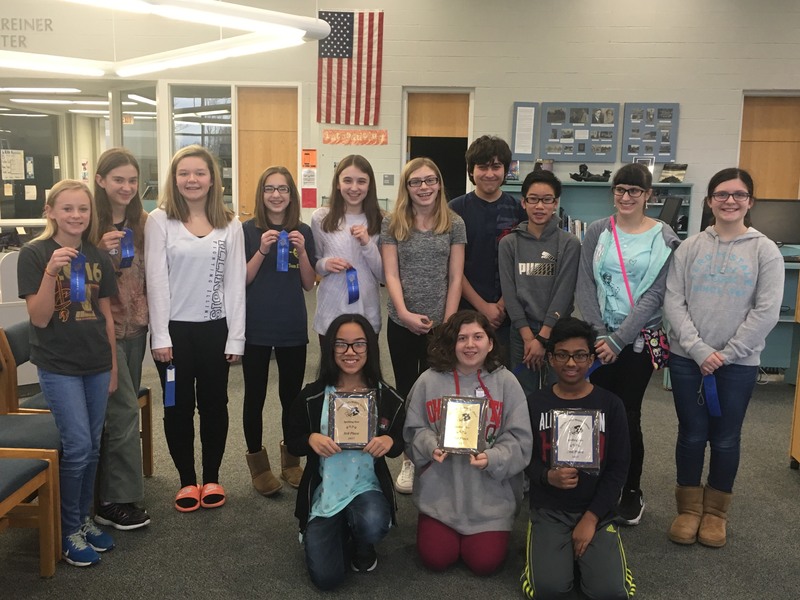 Congratulations to all Olmsted Falls Middle School students who competed in the school’s annual Spelling Bee. Top winners are Lauren Burch, first place; Sanat Subhash, second place and Megan Nguyen, third place. Pictured here are the students who earned awards as well as Molly Laubert, grade 8 math and science teacher/OFMS cross-country coach. The three top winners holding their awards in the front row are, from left, Megan, Lauren and Sanat. Congratulations to five OFHS senior student-athletes who signed official letters of intent this week to continue their athletic careers at the college level next year during a special signing event at OFHS. Students were joined by family members, coaches and teammates as they officially signed letters of intent to participate at the college level. 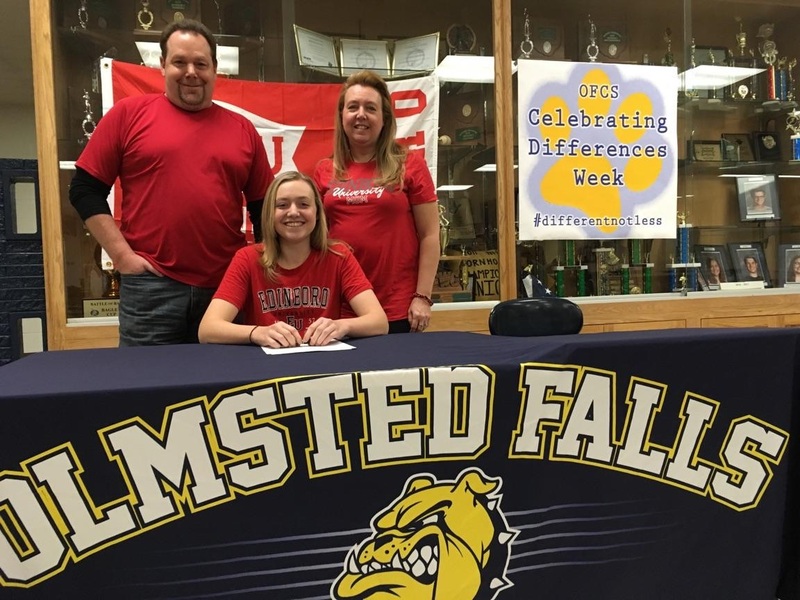 Skyelar Alstadt will play soccer @ Edinboro University in Pennsylvania. 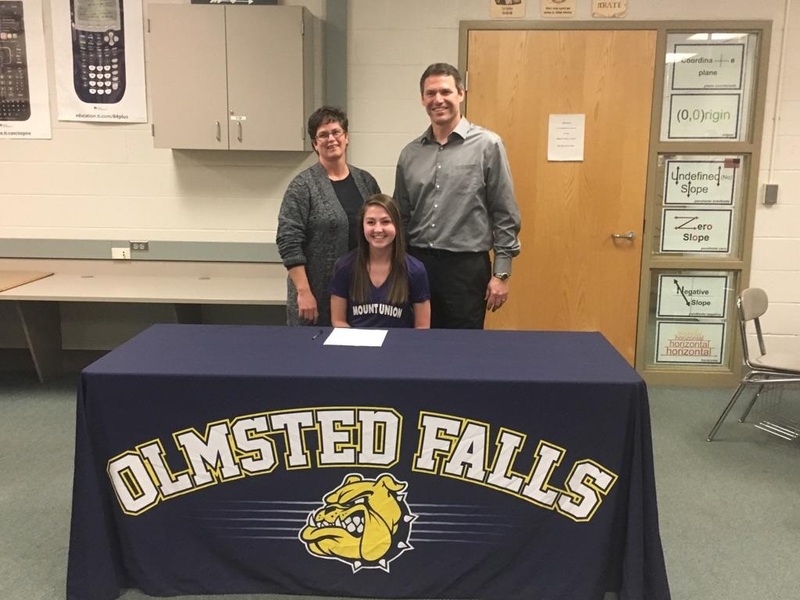 Brittany Chapman will play soccer at Mount Union College in Ohio. Lexi Gomez will play soccer at University of Illinois at Chicago. Cameron Robinson will play soccer at Gannon University in Pennsylvania. 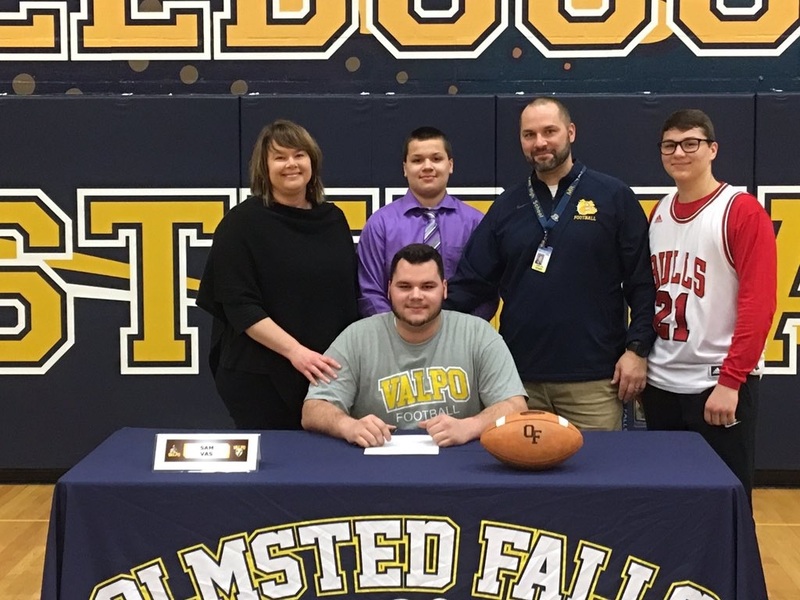 Sam Vas will play football @ Valparaiso University in Indiana. Stay tuned for additional letter of intent signing news! Congrats again and best of luck to these outstanding athletes! The segment, discussing high school graduation requirements, was featured on “The State of Ohio” program which also airs on The Ohio Channel. 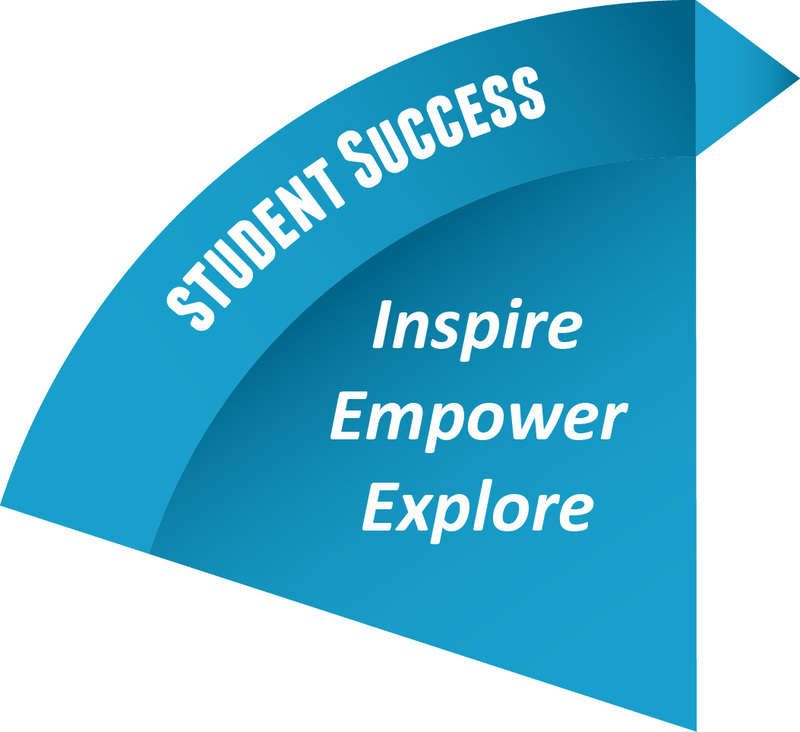 Follow Dr. Lloyd on Twitter @OFCSSuper. The 30th annual High School PTA Talent Show was held Saturday at OFHS. Congratulations to the following students on their performances. Isabella Goldshmidt – First Place tie, piano solo medley of songs by Nancy and Randy Faber. Lindsey Smits – First Place, vocal performance of “Sing Your Own Song.” Lindsey was also the Overall Winner of the Talent show, having received the highest score of all performers in the show. Elisabeth Helmick – First Place, vocal of “Can’t Let Go.” Elisabeth was also the recipient of the Dara Hosta Vocal Performance Award given by the Hosta Family. Congratulations to all of the Talent Show winners and to all the students who shared their talents in the show. A special thank you to Dan Fidler, Brynn Hanratty, Nico Humphrey and Carson Moore from Golden Expressions who performed the National Anthem to open the Talent Show. 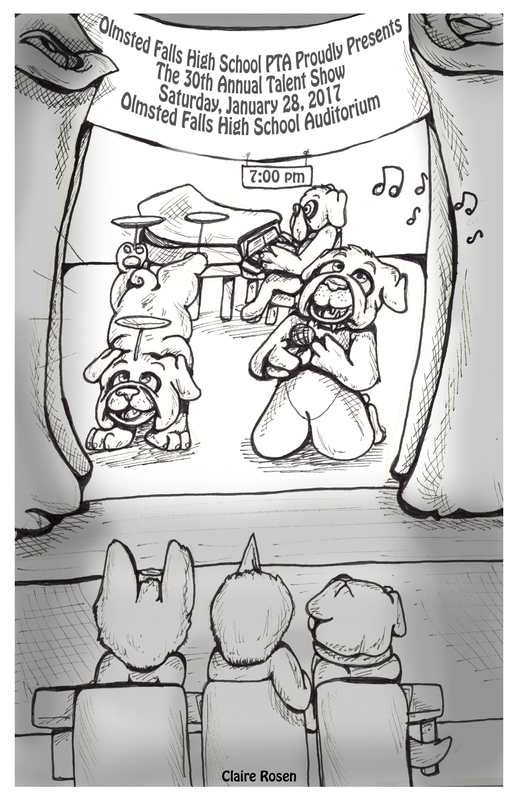 Congratulations also to the program cover design winner Claire Rosen, OFHS grade 12, Graphic Arts student from Polaris whose original artwork appeared on the Talent Show program cover. Great and creative design Claire!! The program cover is shown here on the right. And what would a Talent Show be without a Master of Ceremonies? 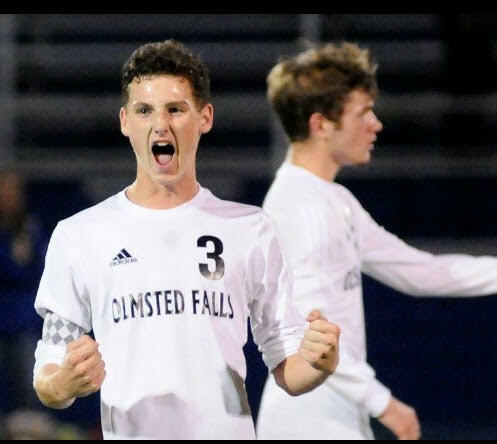 Thank you Danny Doherty, OFHS Junior. Many thanks as well to the OFHS Stage/Sound/Lighting Crew Gabe Gulla and Jack Corrigan. A very special shout out to Dave and Jessica our special musical performers who entertained the audience while participant scores were tallied. Our most sincere gratitude to Fonda and Bruce Hosta for their continued support of the Talent Show through donation of trophies and the prize for the Dara Hosta Vocal Performance Award. Many thanks to our PTA volunteers who helped make this event a success and thanks to our wonderful audience. All proceeds from the show will benefit Class of 2017 graduates with scholarship awards. It was a great show! We hope that our K- 11 performers will return again next year. We can’t wait to see what talents you will share with us! Parent and student volunteers are gathering at Shaker’s MarketPlace at 9 a.m. 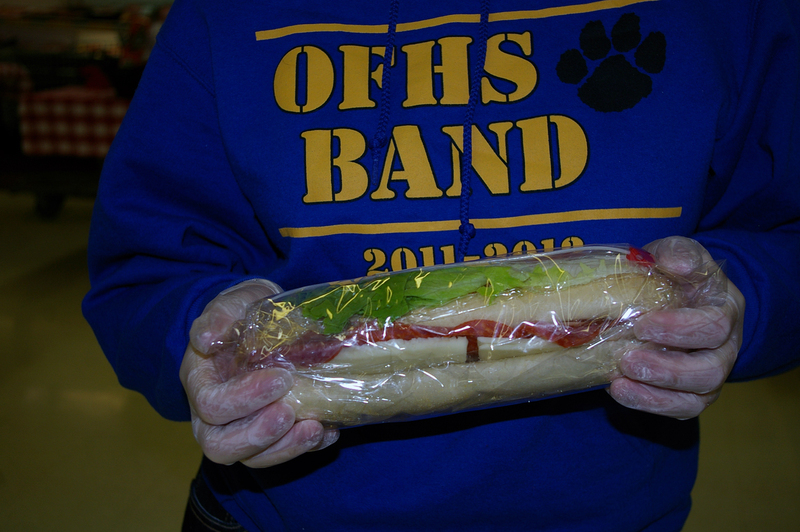 TOMORROW – Saturday, Feb. 4 – to assemble more than 1,000 sandwiches for the annual Olmsted Falls Music Association’s Super Bowl Hoagie Sale. Any additional volunteer support is appreciated! Just show up at 9 am to help! NO experience required!! Students will deliver pre-ordered hoagies on Saturday for those wishing to save them for Super Bowl LI on Sunday. Students who have been selling hoagies need to plan to pick up their orders for their deliveries Saturday. Music students have been working hard gathering orders, and some hoagies will also be sold at the store. Hoagies are $5 each. Thanks to all of who have helped get this done! 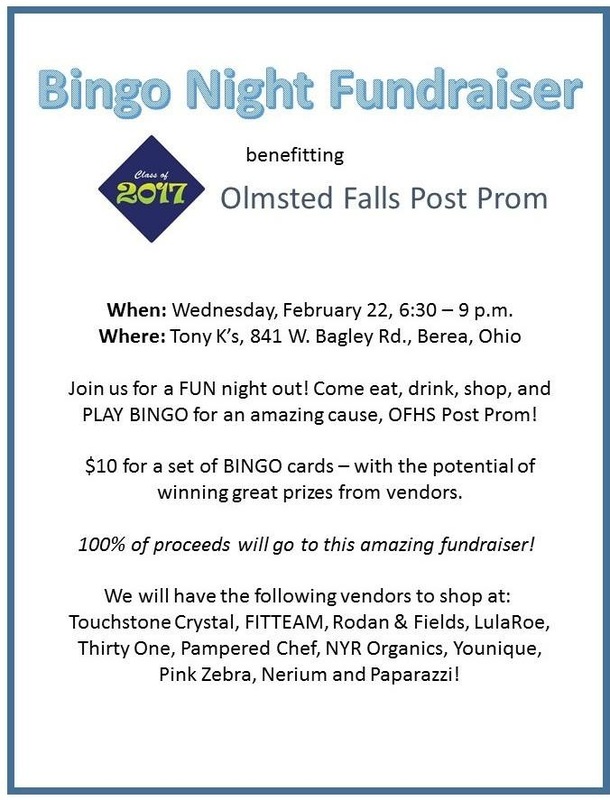 Enjoy some friendly games of Bingo this Wednesday, February 8th at Tony K’s with proceeds benefiting Helping Hands. Doors open – and shopping with participating vendors – at 6:30 p.m. with bingo starting at 7. The cost is $10 for a set of bingo cards. Prizes will be awarded each round from participating vendors. Why not dine out and have fun doing so playing Bingo. Reserve your spot by emailing helpinghands@ofce.net by Tuesday, February 7th. Olmsted Falls Alumni Association’s Las Vegas Night is February 11th. 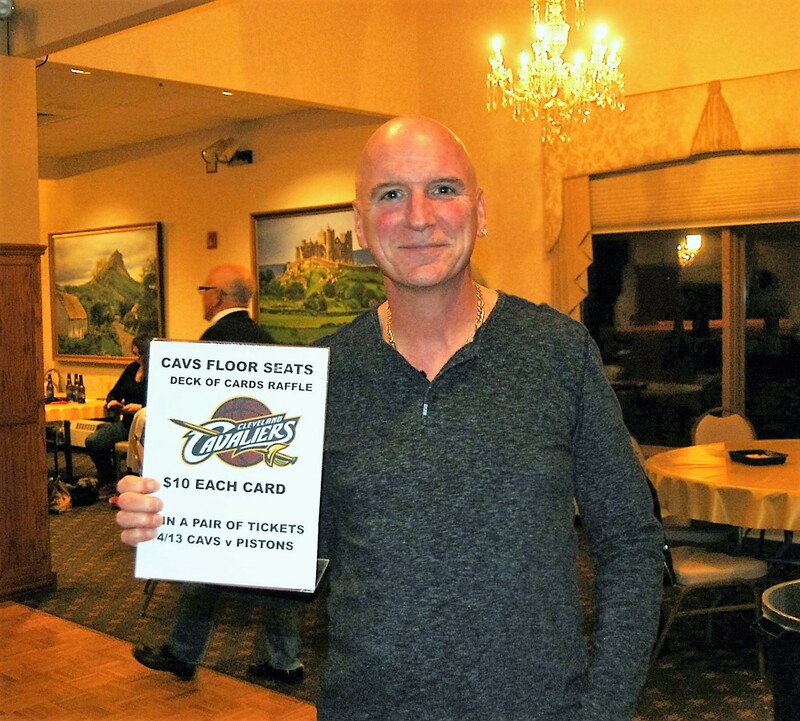 Two sets of Cavs floor seats will be raffled during the event. It’s easy to win – just purchase a playing card for $10. You will have a one in 52 chance of winning a pair of floor seats to the April 12th Cavs vs Raptors game. Indians tickets also are part of a giveaway. Who will be the lucky winners of these special prizes? The Olmsted Community Summer League (OCSL) offers baseball and slow-pitch softball leagues/games for boys and girls ages 4 through 18. We accept kids of all skill levels and require little to no travel. Registration is open from February 1st until March 31, 2017. 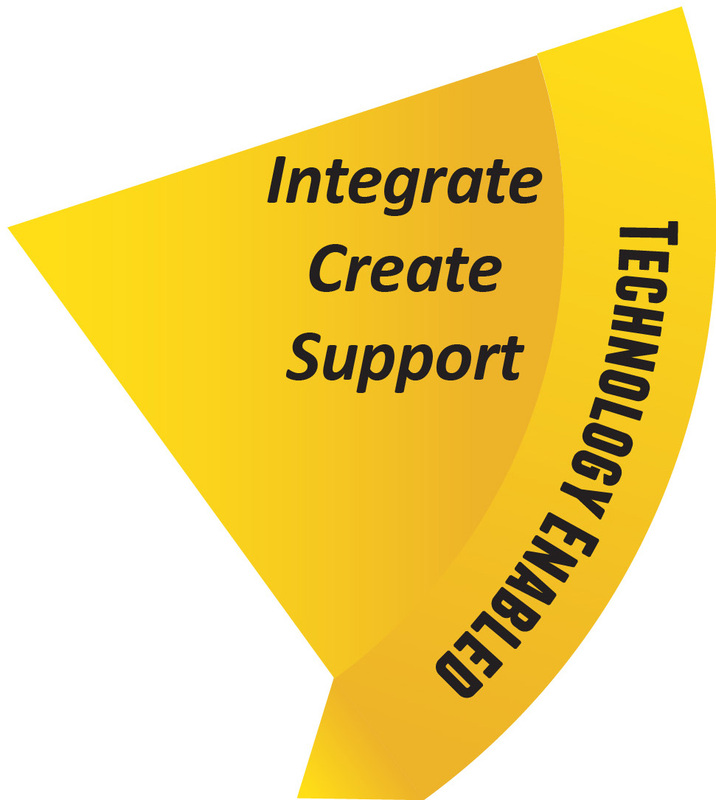 To download the OCSL flyer, please click HERE. To register, visit the Olmsted Community Center website at www.olmstedcc.com or in person at the OCC on Mapleway Drive. New this year, if you register by February 28, 2017, you will receive $5 off your registration fee. Registrations after March 31, 2017, will incur a $20 late fee and will only be accepted until April 15, 2017. Please like OCSL on Facebook for frequent updates and news about our league. We look forward to seeing you on the ball fields. Any questions please contact the OCC at (440) 427-1599.